The Gilera 500 4C, the latest evolution "Rondine"
The CNA Rondine, also known as Gilera 500 4C is an Italian motorcycle manufacturer. Unlike the traditional trend for technological motor companies, usually established in northern Italy, this story began and developed in Rome. In 1923, Carlo Gianini and Peter hesitation were two engineers that graduated and lived in the capital, in a turbulent period that followed the march on Rome and the Matteotti crime. The two engineers oppened a small shop in the center of Rome near the Diocletian Baths They designed a sophisticated 4-cylinder engine but had to suspend their work because not have the capital necessary to carry out the 'Propeller' prototype. Thanks to some friendships through the university, offered the opportunity to submit their ideas to Count John Bonmartini, a wealthy Roman nobility, who became famous for having participated in the march on Rome and accompany them from a small plane made by the NAC (National Aeronautics Company), which he founded. Wanting to get in good light nell'Italia "enthusiastic and daring" of the time, Bonmartini decided to finance the project and, in 1926, called the company GBR (acronym Gianini Bonmartini). In less than two years they brought out the first version of the engine: half liter air-cooled, which developed the bench strength, and remarkable for its time, 28HP at 6,000rpm. Given the good results in 1927, the three decided to form OPRA (Officine Precision Automotive Romana). The intention of the founders was for OPRA to develop an engine and offer it to Case a European car manufacture for the construction license. The new engine was equipped with a cooling system and power went up to 32hp at 6500rpm. However, the 'Propeller' was not very successful and some differences with Bonmartini, they decided to move away from the company. The activities of OPRA Spa was stopped and to be liquidated at the end of 1929. The company ended up being absorbed by CNA, in confluì also Gianini, which were entrusted with the direction of the department design aircraft engines. 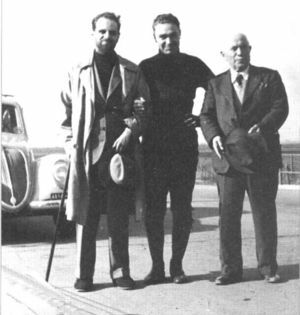 Gianini also distinguished himself in aircraft, designing and building for the lightweight CNA Propellent "C7" for air touring, an engine adaptable to various aircraft that developed 180 hp power. The Propellent, mounted on a "Fiat AS.1" airplane was awarded the world record height for air touring, by Renato Donati reaching 8334 meters on December 10 1932, at the Littorio airport in Rome. The opportunity to take in hand the projects, "Rondine" appeared two years later, when it was established the Grand Prix motorcycle Tripoliby Italo Balbo, now governor of the Tripolitania and Cyrenaica, after leaving the chair of Minister dell'Aeronautica. At the time he was minister, Balbo had clashed several times with Bonmartini as managing director of CNA. 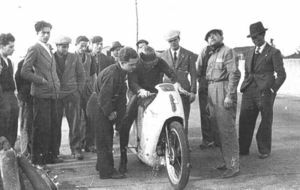 Among them a strong political antagonism was born and Bonmartini had the idea of sending two motorcycles to Tripoli to win the 1935 GP. The desire for redemption of Count Bonmartini and Gianini, although with different motivations, made possible the realization, in just eight months, a new motorcycle, which was created on the basis dell'OPRA, but further developed, and regardless of costs. The evolution of GP was provided with volumetric compressor, distribution with double-camshaft, imbiellaggio benches and rolling, pipes of cylinders nitrides, exchange preselettore with a 4-speed transmission and chassis sheet printed. The power for these years, is impressive: 87 hp at 9000 rpm. Bonmartini (claudicante for the fall in an attempt to record) with Taruffi. The fruit of the work will be baptized with the name of 'Rondine'", in memory of the plane that had overflown the march on Rome. Two "Rondine," entrusted to Taruffi and Rossetti, were send to the GP of Tripoli in 1935. 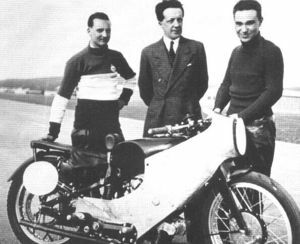 Despite the official presence of large constructors such as Guzzi and Norton, the "Rondine" won first and second place under the eyes of amazed that Italo Balbo, rather than be forced to reward his rival, left the stage. With all the success, Bonmartini gave the "Rondine" and its policy levied, placed themselves at the head in an attempt to beat the world record for speed and launched this by appointing Firenze-Mare at the helm. The record was conquered by the Taruffi in November 19 1935, covering the distance of a thousand meters in 14.72 seconds with an average of 244,316 km/h. But it was short lived. The fight between Bonmartini and Balbo turned in favor of the latter and ending the noble Roman politics. 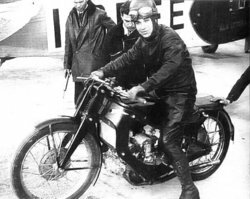 CNA company was nationalized and the "Rondine" was sold to Caproni that fast motorcycling experience, Taruffi was commissioned to find a buyer. Taruffi offered it to the Gnome et Rhône, Moto Guzzi and finally to Gilera but with no comforting answers. After the initial rejections Gilera would offer for six motorcycles to be built and parcel of the drawings. This offer was very small, but that was immediately accepted by Caproni, eager to get rid of that "dry twig". The further development of Rondine was immediately implemented, thanks to the care of that obstacle, meanwhile, was up in Gilera. 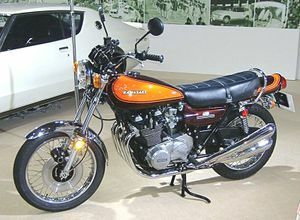 The Kawasaki 900 Z1 of 1972, one of the most successful Japanese models, inspired by the "Rondine"
The "Rondine", now the Gilera 500 4C, won numerous international competitions in the preceding years of World War II. 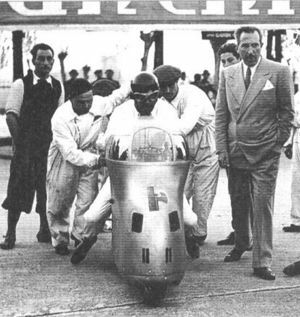 The bike also broke the world speed record of 274,181km/h, once established by Taruffi in 1937, on the highway Milan-Bergamo. 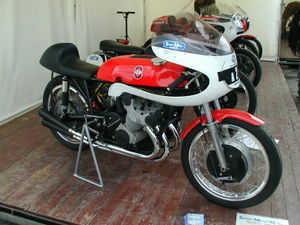 After the war and the insurgence of international competitions, the Gilera 4C was the bike to beat, but the opposition saw the possibility of achieving this. It was probably because of the instance of the "winners" British sports authorities forbade the use of the compressor. The Gilera 4C was put into retirement at the end of 40s.